This deeply flavored dish is a beautiful example of Southern Thai cooking, which makes use of a broader array of spices and herbs than most Thai curries. It's the vegetarian equivalent of Massaman chicken and beef curry, which are hearty and robust with warm spices. Arab traders brought these exotic spices, such as whole cardamom, cinnamon, and nutmeg, to Thailand several centuries ago. You'll find the flavors so lovely, and the textures of the vegetables so satisfying, there is no need or desire for meat. And because there are beans in this dish, the combination of curry and rice makes for a complete protein with all the amino acids you need to be healthy and happy. Vegetable curries are becoming more popular in Thailand now that vegan and vegetarian restaurants are springing up everywhere. It's a wonderful cuisine for veggie lovers! Heat a deep, medium-size pot over high heat. Drizzle in oil and add garlic, galangal or ginger, onion, and chili. Stir-fry 1 to 2 minutes. Add stock plus bay leaves, turmeric, ground cardamom, cumin, cumin seed, ground coriander, cloves, and soy. For the whole cardamoms, use the flat side of a wide knife to smash them open (put pod the under the flat side of the knife, and come down hard on it with your fist). Then add both the shell and seeds to the curry pot. 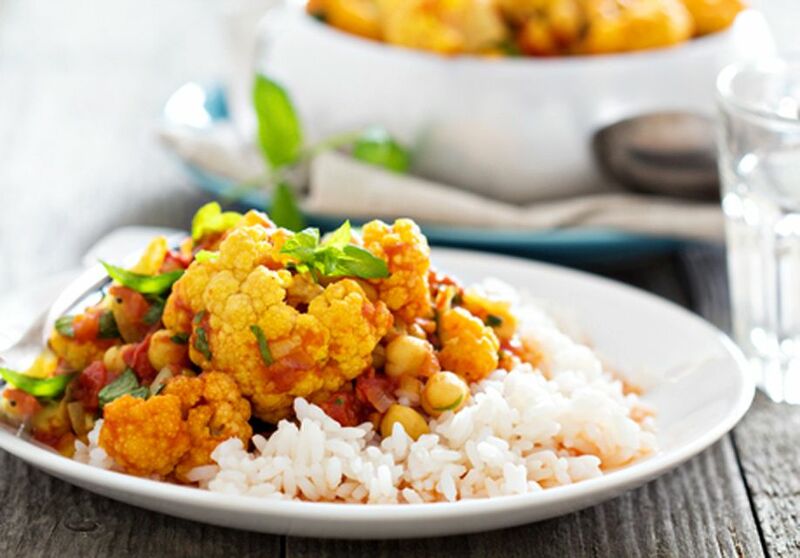 Add cauliflower, pumpkin, carrot, and chickpeas. Bring to a boil, then reduce heat to medium until you get a good simmer going. Cover, and simmer 10 to 15 minutes, or until everything is cooked to your liking. Add cherry tomato halves, and simmer another 5 minutes, or until soft. Reduce heat to low, and add 1/4 can coconut milk. Taste-test for flavor and saltiness, Start by adding 1 tablespoon soy sauce. If more is needed, add sea salt, taste-testing until the desired flavor is reached. If too spicy, add more coconut milk. Top with sliced green onion and chopped fresh coriander or basil. Serve with Thai jasmine rice and enjoy!